We checked out of the hostel and headed back to the central station where we were due about an hour of hanging around before our train would depart. Fortunately, we were blessed with a jazz band performing which kept us suitably entertained for the duration of our wait. Soon enough we were on our way, the views of the Elbe valley and the towns that littered the hills being some of the most beautiful and impressive sights of our trip so far. After a short while the scenery began to change as we entered the Czech Republic and the train eventually rolled into Prague. We had a short walk through the city, past the National Museum to our hostel where we dropped our stuff and went straight to the bar for a much needed pint, or two. On the discovery that the beer was criminally cheap, it was decided that we had better grab some dinner fast before we accidentally got drunk. We took a trek out to one of the less tourist populated areas of town and found a Lonely Planet recommended restaurant where (yes, you guessed it another addition to the menu) I enjoyed a meat skewer and David tucked into a local dish of Norwegian Salmon. We also found that the beer was even cheaper and the night quickly disappeared under a golden haze of Czech pilsner. Despite our best intentions we awoke feeling reasonable and quickly took on some breakfast. We then attempted to book a reservation for our train to Warsaw, but due to restrictions and an entirely useless website we failed to get a night train and needed to book an extra night in the hostel. Once the journey to Poland had been sorted we headed out into the city, down Wenceslas Square, through the Old Town and across the river towards Prague Castle. After an almighty up hill struggle we made it to the summit and were rewarded for our efforts with glorious views across the city. We then headed inside the main castle walls and enjoyed the cobbled streets and various architectural styles before arriving at the central Cathedral where we stopped to enjoy the shade it offered from the sun that had been beating down upon us. 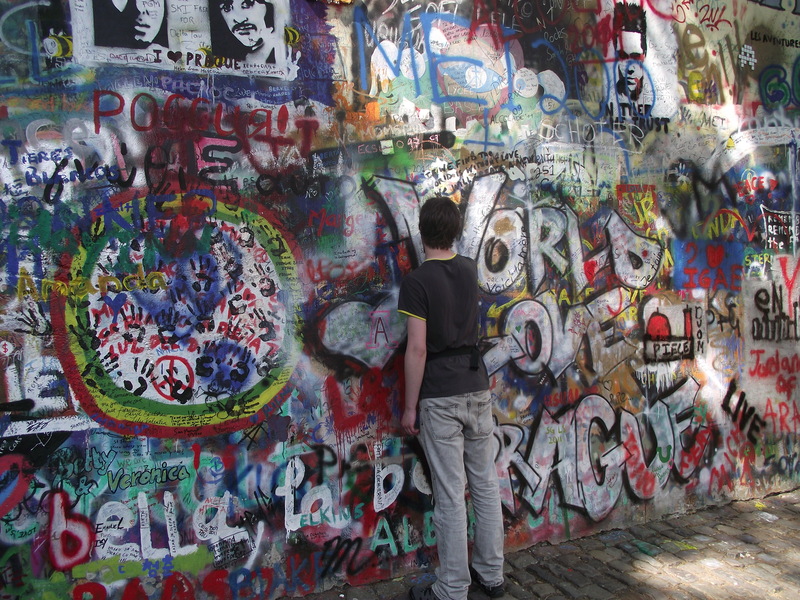 We then began our descent, heading through various alley ways and side streets to discover the Lennon Wall; formerly a celebration of the fall of Communism and now an ongoing art project where David rightly felt it would be necessary to leave our mark. We then returned to the river and crossed the Charles Bridge and followed the banks back to the hostel for a much needed shower. As David and I began to consider our dinning options an almighty storm broke out over the city and the rain fell in sheets in a vast contrast to the glorious sunshine we had been basking in throughout the day. We weathered the storm for a while and on it’s passing found a Thai restaurant just around the corner and indulged in some great food and not too many beers, even finishing off with a pot of jasmine tea. The following day we awoke at a reasonable hour and headed out fairly early to try and find the Communist Museum that had been so elusive the day before. Having not much knowledge about Communism in the former Eastern Bloc or at all I was impressed with the lesson in political history that I received and took in a great amount of information from the Nazi occupation right up until the fall of the Iron Curtain in the late 80s. It was a moving experience to learn how that some of the Czech people who had fought in the uprising against the Nazis were then imprisoned as war criminals by the occupying Soviet forces. From the museum we walked back through the city, across Charles Bridge once more and found a bench at the base of one of the city’s many parks. After a brief stop, we walked through the park which wound around a particularly steep hill. By this stage however, a chest infection that had been picked up in Helsinki and largely ignored had started to get the better of me and I was forced to return to the hostel to sleep it off. Upon re-awakening and feeling significantly improved we checked out a Bohemian themed restaurant where we found even cheaper beer than our previous outings and plates of food bigger than I am. We then took an early night to help aid my recovery. The next morning came and I was feeling better, nothing like good food and cheap beer to fight infection! We had to check out of the hostel and move rooms and would have to check back in again in the afternoon. We left our things and went down the river towards Vysehrad, another fortress with similarly excellent views but this time of the river and the valleys it carved on it’s way into the city. Within the fortress walls there was an exhibition on ‘Winton’s Children’ which shared documents, history and stories from Jewish children rescued from the Czech Republic prior to the Nazi invasion and occupation which served as yet another haunting reminder of the suffering that the country had been subjected to.